Get ready to bite into a sweet, cream-filled, crunchy filo layered pie called bougatsa, fork into perfectly fried doughnut balls drenched in honey called loukoumades, and savor a satisfying meld of flavors from warm pita bread filled with seasoned grilled meat, fresh veggies and a traditional sauce called gyros. In between, you’ll taste Feta cheese, Greek olives, and sip Greek wines. This neighborhood walk revolves around sampling Greece’s traditional food. Our Athens Walking Tours guide will lead you through the bustling Athens Central Market, a historic food market unlike any other in Europe. Here, colorful and fragrant food stalls set the stage among animated food sellers, fishmongers and butchers whelping for sales as locals bargain them down. You’ll also walk the city’s quaint spice street, browse through mom-and-pop specialty shops selling local wine, olive oil, cheese or olives, and sample what’s behind the glass counters at family-run delicatessens. The aromas of fresh, out-of-the-oven savory pies, the tempting displays of Greek pastries and sips of Greece’s strong and tasteful spirits round out the food tour. In between each bite, you’ll gain insight into Greece’s fascinating food culture, the evolution of the country’s cuisine and the healthy nature of locally produced, organic ingredients. 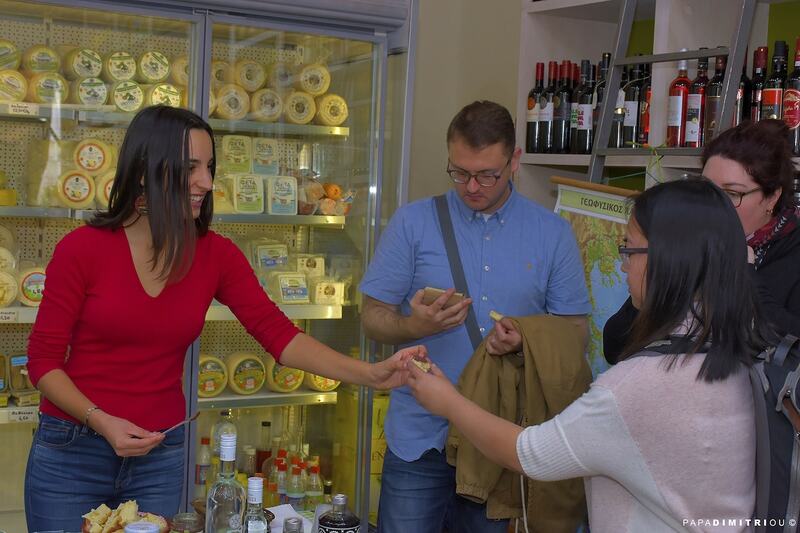 Our Athens Food Tour is vegetarian-friendly as only one or two stops involve meat tastings where we would be happy to provide alternative sampling when requested. However, there are limited choices for other dietary restrictions such as gluten-free or dairy-free. If you any of the above dietary requirements or serious FOOD ALLERGIES please contact us or call us before purchasing tickets. 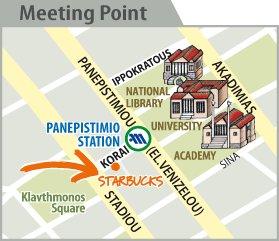 The meeting point is outside the Panepistimio metro station at the Korai pedestrian walkway in front of the Starbucks. If you use the metro to come follow the "Korai" exit signs. Please be at the meeting point by 9:15 am. The tour starts at 9:30 am.